1st September, 2006. In this issue: All New Fishing Books, All New Maps, New 365 Day Fuel Price Trend Reports, New Article - Camp Tables and the Places system. Welcome to the first newsletter for Spring 2006. This newsletter brings new articles, new site features and the launch of a new range of books and maps just added to the ExplorOz.com Adventure Shop - from Explore Australia Publishing. Two great fishing books ideal for beginners and enthusiasts. A unique guide to the people and places that make Australia special. Produced in conjunction with the ABC this entertaining and informative guide taps into the valuable local knowledge and tells you what others don't! Perfect to use on the road with large-scale maps, bypass maps together with outer-city routes. Includes16 pages of "4WD Tours Out of Capital Cities". Les Hiddins' favourite parts of northern Australia - covering 5 regions of northern Australia and 15 tours you can do yourself; includes a photographic list of more than 170 bush foods; a section called "Making the Most of your Trip" and 34 pages of road maps. Not just for backpackers - includes every aspect of travel throughout Australia for travellers, campers, caravanners and international visitors. Ideal for journeying around Australia on your own.Includes practical information on everything you need to know. This books gives you all there is to know about the slopes, resorts and alpine towns of New South Wales, Victoria, Tasmania and New Zealand. A new report has just been added to every State's Fuel Price report showing the trend across the last 365 days. This new report will appear beneath the existing 60 day and 180 day trend reports for each state. 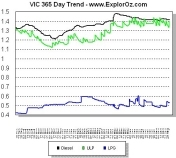 To access Fuel Price reports on ExplorOz click here. This article is written to help people who have yet to experience the camping lifestyle and have yet to purchase a camp table. Contains practical buying considerations and lists typical camping scenarios showing the versatility of how you'll use your camp table(s). To read full article online click here. Are you one of those people that takes GPS waypoints and/or photos when you travel? Did you know that ExplorOz offers you an easy place to upload and share these things? We invite you to browse through the current list of 66,000 Places throughout Australia and upload photos and descriptive text for existing Places that you know something about. Furthermore, if you have a .wpt file you can even enter a New Place into the system. Information sharing is the very heart of what the ExplorOz community is all about. So go on, make an effort and sort through your files and photos and contribute to Places. To go to ExplorOz Places online click here. And finally, we'd like to send our best wishes for a Happy Father's Day to all Dad's out there this weekend from all of us at the ExplorOz Team.